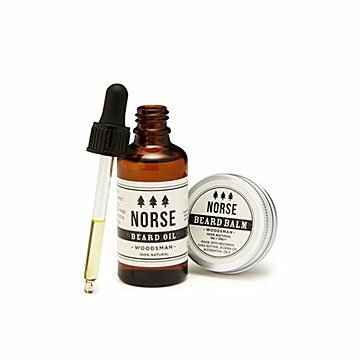 A no frills beard oil and balm inspired by rugged, woodsy Scandinavian men. Be the beard you want to see in the world. That's our motto—at least when it comes to facial hair. Help yourself or a bearded loved one get there with this no-frills set. It's inspired by those woodsy guys in Scandinavia—you know, the ones who strike the ideal balance between rugged and handsome. Start with sweet almond and jojoba oil for intense moisture, then style and shape using the shea butter and beeswax. It makes a great gift for lumberjacks, professors, and anyone else who takes pride in their facial fur. Made in small batches in the United Kingdom. Gift Box: 6" x 5.8" x 1.5"